This week's Next 20 community builder is Joanna Riquett. Joanna, along with her husband Dario, are the creators and publishers of Hayo Magazine—a travel, culture and curiosity coffee table magazine. Her curiosity has led her to visit and immerse herself in over 20 countries to gather and share stories and images. For Joanna, travel is as much about discovering new places and cultures, as it is about self-discovery. What inspired you to launch this magazine? I studied communications and journalism back in Colombia and then I moved to Argentina and started my Masters in content management, which led me to a career in project management for websites and ads. Then almost three years ago I moved to Vancouver—my husband's town. Being in a new place was an opportunity for me to really think about what I wanted to do with my life. I had always done travel writing on the side, and so the idea to launch my own magazine about travel, culture and curiosity was something that I really wanted to pursue. I didn't study magazine publishing so I was unsure as to whether I could successfully launch a magazine. 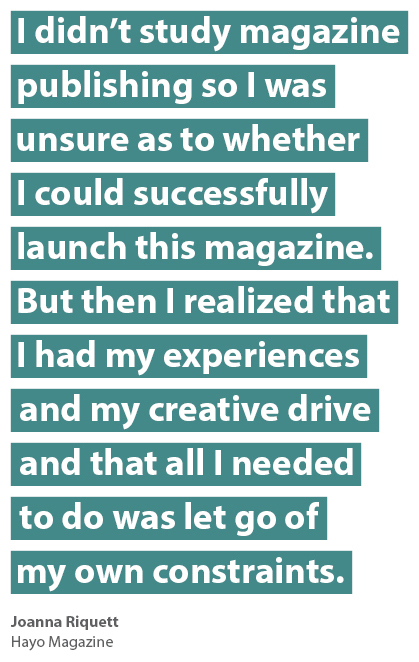 But then I realized that I had my experiences and my creative drive and that all I needed to do was let go of my own constraints. I decided that I was going to just go for it. The first issue of Hayo launched in September of 2015 and the second issue is just over one month old. "Hayo" means "let's go" in Indonesia jargon. Creativity is the ability to put different disciplines, interests and passions together. Creativity is how I get from zero to one hundred in order to turn my ideas into reality. Creativity is the way we can solve problems and work through challenges and find different ways of approaching certain ideas and situations. What promotes the development of creativity? Constant research and exposure to information, ideas and inspiration is what develops my creativity. Paying attention to details, being curious and always wanting to learn more about things is also a big part of developing creativity. What is the value of art in education? I think art enables curiosity, and curiosity provides the spark to pursue education. Art and creativity are what allow the mind to be open. And when your mind is open, it is easier to connect with the information you are presented with and easier to find ways to turn that information into something relevant and useful for you. Technology has had a profound effect on all of us. Now that the presence of computers and phones has started to normalize, I've noticed a return to the craft. I know many talented people who are producing candles, herbal therapies, vinyl albums and things like this. I’m also noticing a return to the cycle of caring—people care more about the food they eat, the cream they use, and they are more aware of the impact of the choices they make. When I think about the future, I think that there may be flying cars, fancy tools and more automation, but I know that art will be a constant. I believe humans will still find great joy in making and experiencing art. Artistic expression is so personal and I don't think that is ever going to change. How does creativity boost your ideas?